For a couple days last week we spent some time checking on a few small streams. 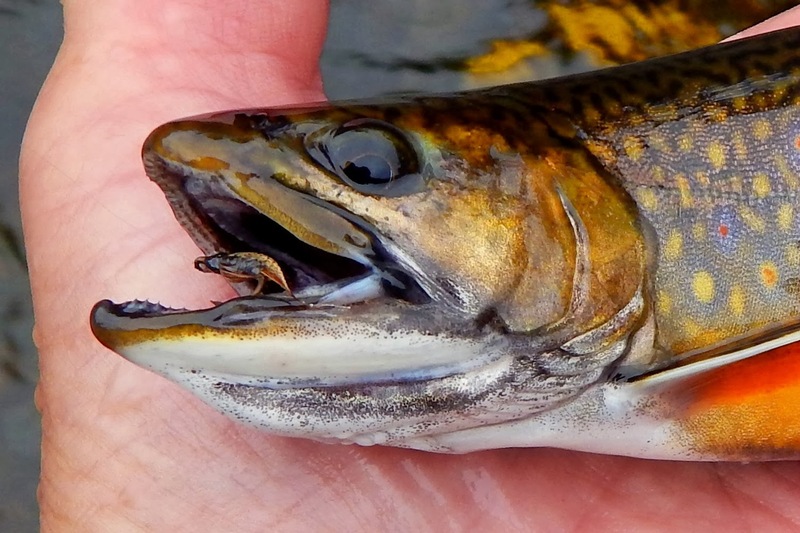 These streams all contain wild brookies, and this is there season to carry on. The weather has not been kind as far as rainfall, but the temps have been ideal. This first stream flows through state land. I stopped on a dirt service road and walked slowly to the concrete bridge where the stream flows under. Upon looking into the pool I observed several brookies working the gravel. There were a lot of 3-5 inch fish there and a nice male about 7-8 inches. I stayed there motionless and observed to goings on. I attempted to take a photo and was soon discovered. Those fish headed for cover. We looked for a spell and decided to leave. All that they need. Cold clean water, even if it's low and this miracle of nature will survive. This is a pool located in "Jim's Brook". As you can see there is brook trout activity. There was quite a bit of pushing and shoving. I can't wait to take the TQR out for some of this angling. Just a few thoughts on some "stuff". For years I've used a braided leader. I have always found them to be one of the better innovations to come into fly fishing. They are attached to the fly line by a loop, and then your tippet is attached at the other end. Changing is very easy and does not require that somewhat difficult nail knot. It's all about simplicity. The braided leader I have always used was an Orvis Braided Leader, but I've seen a similar leader offered called a furled leader by FeatherCraft. I purchased a couple in various sizes and have been using these on my last several outings. They differ from the Orvis leader in that they have a micro ring connector at one end instead of a loop. They come in various lengths which I find useful on some real small streams. They have great pickup on the water and do not cause a spray when casting. Another plus is the cost. The Orvis leader is 14.95 and the Feather Craft is 12.95. I purchased this fine chair a week or so ago. It's a slider chair that's so comfortable. It's placed in a spot with lots of natural light, great for reading, napping, or watching TV. This book was purchased about a week before the chair. While I don't fish for steelhead I do enjoy reading about this wonderful fish. This book is almost finished, and it is a great read. It's like reading this mans journal. A good title, maybe for someones Christmas stocking. We have been out checking on several of those "thin blue lines" I love, and we have found them to be in not to bad a shape. There are spots where the water is thin but there are also some pools with deep water. I managed to get a few hours on a stream today. I have been a bit under the weather and a few other problems also. But this morning I felt good and the stream awaits. These last few day have been quite blustery, and temps have been pretty cool. The stream was in wonderful condition except for the huge amount of leaves being blown into the water. I have fished this stream many times but in a different area. Today I decided to fish it further downstream. This section is a series of runs, riffles and long pools. The waters are home to wild brown and brook trout. The flies selected for today were wet flies of various patterns. It did not take long for the first trout to hit, and they pretty much kept right on taking for the time I was there. There is still some beautiful foliage left to be viewed. I saw this brookie take the fly. It came from a leaf covered bottom to grab the fly just under the surface. 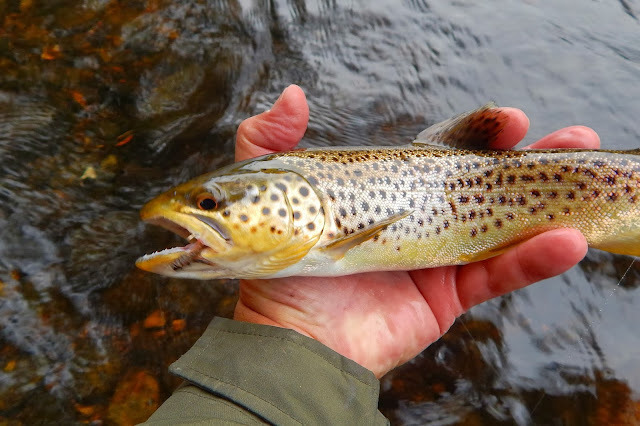 A brown taken from some slack water. Typical brown holding water. I took a lot of photos today, Autumns last paintings. My buddy accompanied me today, as he has for almost 25 years. Those wonderful days of Autumn are dwindling. The days of warm sunshine and colorful foliage are almost at an end. Jeanette and I took advantage of one such day this week to do something outdoors we both enjoy. That is to walk a woods road and just take in all that the season has to offer. We found numerous flowers that have gone to seed. Their silvery color, like icicles when hit by the sun. Milk weed pods were almost everywhere, and as we walked by an apple tree the bees were busy enjoying the flavor of a tart Mac. A natural Autumn centerpiece. Red thornberries growing up alongside an old rock wall. The field behind it was full of milk weed and as we walked through it to the brook I felt confident the flush of a woodcock was going to happen. Soon we came upon a prize in the Autumn woods. It was a stand of hickory trees. These strong fellows had dropped their bounty all over the ground. We had brought along a canvas bag for such a find, and we soon began to fill it up. Wild hickory nuts are probably the sweetest nuts one can eat. They can be a bit of a problem when trying to extract the meat. The shells are extremely hard, and if not cracked a certain way they almost impossible to salvage any meat. I do have a method of getting the meat, and with a good amount of it Jeanette took some oatmeal and chocolate chips, along with a lot of hickory nuts and made some cookies. A fresh hot cup of Nantucket coffee and a few cookies were a treat on this fine October day. There is a stream in northern Connecticut that I've had the pleasure of fishing for years. It s a typical freestone mountain stream with large boulders and lots of twists and turns. I do not know its origin, but it must be full of water for this stream has ample flows at a time when rain has been a bit scarce. The stream flows through large stands of hemlock and hardwoods and has a beautiful amber tint to its waters. The smells of this woodland are hard to describe. Just upstream from the pool in the first photo is a tributary to the brook. This trib comes in through private property and also has real good flows. One day while fishing the stream I had the pleasure of meeting a lady who was walking her dog. We stopped to chat and she was very helpful in my quest to find out more about the little trib. She told me the name of it was Jim's Brook, a name given the stream by a landowner that owns a large chunk of the property that the stream flows through. She told me where the house was of the landowner. Now I have a good chance to perhaps gain access to Jim's Brook. By the way the lady I was talking to was 87 years old, and she said she would love to tell me some stories about the brook I was fishing but she had to get to work. " God Bless her"
I fished the stream that day, the leaves of many of the hardwoods have already fallen. As the sun hit various runs and pools I noticed a brook trout or two dart for cover. It's a beautiful time of year to drift a dry fly through tea colored waters. The leaf litter on the bottom seems to reflect the colors of fall so brilliantly to the surface. In one such pool I was able to get this jewel to take a dry fly. The brookie and water in which he came from were almost the same. I now have a place to explore. Perhaps "Jim's Brook" will as good as the brook it delivers its cold waters to. They say that ninety percent of a trouts feeding takes place underwater, and probably seventy percent of that underwater feeding is almost on the bottom. This is why a nymph fisherman can be so successful, he puts the food where the trout are. Then between the bottom and the surface is that sweet spot where the other twenty percent do there feeding. That's where the wet fly comes in. Wet flies have been around since about the time of Walton, and many of the patterns were of English design. These flies took some pretty selective trout from those early times. The patterns available today are perhaps in the thousands, and many of them are very beautiful and many look like they should be gobbled up. The wet fly looks like an emerging insect, or in its other function can be a tremendous attractor drawing some very vicious strikes. Wet flies are suitable for both still water and river. In this post I'm going to speak of river, small stream use of these flies. These flies will take the simplicity route which I favor. I have had much success with the few patterns I tie. I use some basic dubbing, various colors of hackle, and waterfowl feathers also in various colors. I try to keep them sparse and I have found out that the more they are used and chewed on the sparser they get and the better they work. I generally fish them casting, quartering downstream. The fly is allowed to drift freely as if it is a struggling insect. At the end of the drift I allow the fly to remain stationary and hang there for a second or two, then I begin to retrieve it at various speeds. A strike can occur at any point in the sequence, but I have found that the most strikes come as the fly turns and begins to straighten out. I generally fish one fly but there are many anglers who are very good at fishing two and three flies at a time. I have listed a few sites and people who you can contact on fishing and tying various wet flies. These guys are pretty knowledgeable when it comes to these flies. Steve Culton, at http://currentseams.wordpress.com/....Mark at http://fishingsmallstreams.blogspot.com/.....Mark is great at soft hackles. Don Bastian, at http://donbastianwetflies.com/category/wet-fly-photos/..... Enjoy fishing and tying these old and productive flies. A not so funny thing happened to me while fishing Sunday. While trying to step over a rock in the stream I slipped and fell to one knee. It hurt like hell for awhile but then it felt better and I continued fishing. I was fishing the Farmington, where a lot of anglers were also fishing. I don't like close quarters fishing so I relied on a few places where I could find some water to myself. I started out as usual fishing streamers, then wets, and finally dries. All of the methods were able to produce a fish, or at least a strike, but the wet fly far out did the others. For those that follow my ramblings know the dry fly is my favorite way to fish, followed by the wet and the streamer. I have recently received many requests about fishing wet flies, and will address this in my next post. I'm not an expert in this fishing but can give my thoughts on it and I will direct you to a gentleman who can give you some great advice. This brookie would not stay still. He flipped me off in a heartbeat and I wound up with the hook point in hand instead of the brookie. On any stream or river one can find solitude. Several brookies and a brown came from this section. Getting back to that knee. When I went to sleep Sunday night it seemed OK, come the middle of the night I was ready to pull what little hair I have left out of my head. The pain was unbelievable, and remained like that until this morning. Finally the meds have started to take effect. We spent the weekend attending some annual autumn functions. In Southington Friday night it was the Apple Harvest Festival. They had a great band playing, lots of 50's and 60's music including DooWop. There is also the famous Apple Fritters, they are the best in New England, and at times you have to wait hours on line to pick up a few dozen. On Saturday we spent a few hours at the Riverton Fair. This is a classic New England fair held in Riverton CT. on the banks of the west branch Farmington river. It's the place to come and enjoy all that's local. I don't know if the potatoes were grown locally, but they were fried locally and that made them OK.
And this fellow. I tried to make a deal with his owner to maybe get that fine grizzly cape and saddle. The rooster would have no part of it and really put up a "squawk"
After leaving the fair we walked the streets of Riverton and decided to visit Hitchcock chair. This place is a must see folks. The handcrafted furniture is beautiful. The hand painting, the lacquered chairs are truly heirlooms. How would you like to spend some time tying flies, or reading "Trout Bum" in a chair as this. There's a piece of furniture for everyone. Although time is moving on, there are a few more of these Autumn festivals to see. Have to get out and enjoy this wonderful season. Have I ever told you how much I love this fly? Well perhaps I have made a statement or two about it in the past about its ability to take trout. Well such was a day last week. I was fishing the Farmington on a cool overcast day. The activity on the river was slow. A few midges, and some caddis. I started fishing various caddis dries and they were not respected at all. I switched to some streamers, which managed to attract some juvenile salmon. The next choice was the Picket Pin wet fly. On the third or forth swing I had my first trout. The fish proved to be one I could not bring to hand. Several more casts later a brown took the fly, and was like a bull dog. I continued to fish the Pin until interest was no longer paid. I then tied on another staple wet fly in my box. The dark Cahill. This fly was also a winner this overcast day. There is an old saying, "on a bright day fish a bright fly" and on a dark day fish a dark fly" there may be some truth to it. A beautiful river on a gray autumn day. Yes a Picket Pin just moving under the surface was to much for this brown. This brook trout was truly special. He took the dark Cahil on a dead drift, as I tried to set the hook it came free. As I began to retrieve the fly he hit it again, and I managed to bring him in. I can't express in words the feeling I have when I bring one of these beautiful creatures to hand in the fall. Two pretty simple wet flies and a day that's remembered. There is a great tying video on the Picket Pin at Matt Groberts blog "Caddis Chronicles" check it out. Reflections, beauty in the eye of the beholder. Reflections, those times when we recall times both good and bad. Each outing I take the time to reflect on the goings on of that day. I may be at the beginning, just as I walk the road and paths to access the streams. Maybe it's during the time on the water as a fly is struck and a fish is caught or missed. 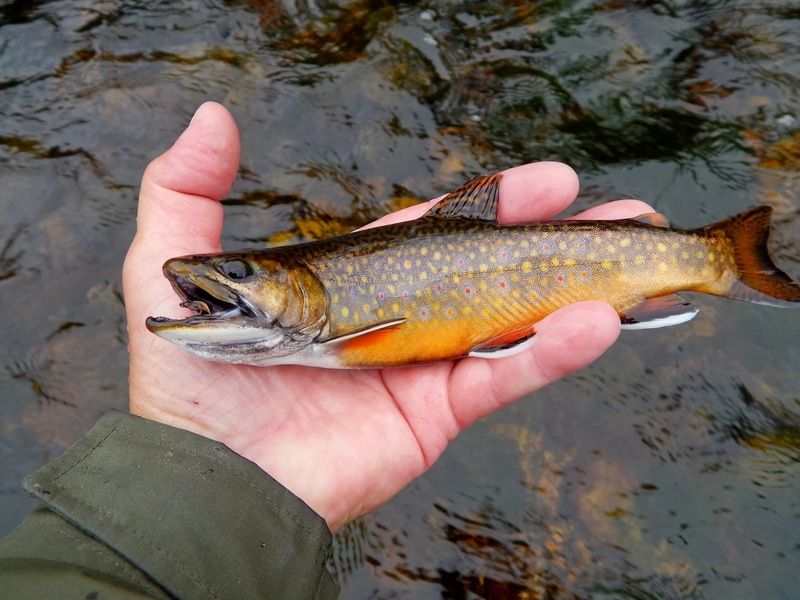 Perhaps its when I have the pleasure of taking a wild brook trout, holding it in my hand for a second or two and releasing it to the water. And then there are the times of reflection at the end of the day. Times when everything is quiet and your mind recalls the beauty of all that transpired that day. There are journals of paper and bindings where we write the happenings of the outing. And there are journals of the mind where said information is stored. While I keep writings of some of my outings, I keep everyone of them in my minds journal.